Francine's Friends: Time to Get YOUR Indiana IBCAT License Plate! Time to Get YOUR Indiana IBCAT License Plate! 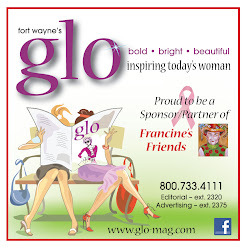 Francine’s Friends is a 2019 recipient of a grant for breast cancer screening from the Indiana Breast Cancer Awareness Trust, Inc. (IBCAT). In 2019 alone, IBCAT granted $445,000 to 30 organizations dedicated to screening mammography and diagnostic programs. Services are available in nearly every Indiana county. In addition to screening/diagnostic services, IBCAT also funds Support Services grants for patients currently battling breast cancer. For assistance, visit www.breastcancerplate.org to find the program that is closest to you. IBCAT receives funds through sales of breast cancer awareness special group recognition (SGR) license plates. Each license plate sold generates a $25 donation to IBCAT. The Indiana Breast Cancer Awareness SGR license plate can be purchased by visiting any Indiana Bureau of Motor Vehicles (BMV) branch, online, or on a Connect kiosk. “Thank you IBCAT for improving the health of women in our communities,” said Francine’s Friends director Marita Dwight-Smith. “Not only does this grant help in the detection and prevention of breast cancer, it’s imperative to the overall wellbeing of those who might otherwise not have access to this important procedure. IBCAT helps us fund screenings in Adams, Allen, Dekalb, Huntington, Kosciusko, LaGrange, Noble, Steuben, Wabash, Wells and Whitley counties in northeast Indiana. We are so grateful for this support from IBCAT and for making a difference in the lives of our patients and their loved ones,” she concluded. Since the Breast Cancer Awareness special group recognition license plate was first made available in 2002, over $5 million has been distributed by the Indiana Breast Cancer Awareness Trust (IBCAT) through competitively awarded grants to organizations throughout Indiana for innovative projects for breast cancer screening, diagnostic and support services not otherwise available to medically underserved populations in Indiana. In addition, over $560,000 has been awarded in scholarships to incoming and current college students who have lost a parent or who have a parent currently battling the disease. The mission of the Indiana Breast Cancer Awareness Trust, Inc. is to increase awareness and improve access to breast cancer screening, diagnosis and support services throughout Indiana. Indiana residents may purchase an Indiana breast cancer awareness special group recognition license plate by visiting any Indiana Bureau of Motor Vehicles branch, online at www.IN.gov/BMV, or on a Connect kiosk for an annual $40 fee, $25 of which is a direct tax-­deductible donation (to the extent of the law). The plate may be purchased for display on passenger motor vehicles, motorcycles, trucks with a declared gross weight of not more than 11,000 pounds, and recreational vehicles.